Question #44: Discuss Isaiah 7:14 indicating three views on the passage. State the preferable view. 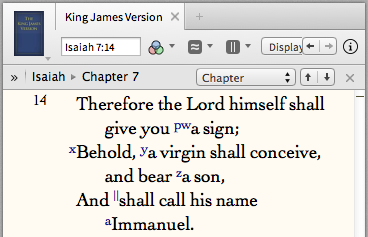 “A virgin shall conceive and bear a son… Immanuel” (Is 7:14). Answer: There are 3 interpretations of Is 7:14. 1) The Contemporary Non-Messianic View–this is Isaiah’s second wife (who was a virgin, assumedly before they married as the passage suggests) giving birth to Maher-shalal-hash-baz (of course after he “went unto the prophetess” Is 8:1-4). 2) The Messianic View–as quoted in Mt 1:23; but it does not answer the question of Is 7:16–which clearly implies the child being a contemporary of Isaiah and the kings. 3) The Double Reference View–is the safest and preferable view to take because it is Biblical, yes it had an immediate fulfillment in Maher-shalal-hash-baz and then a future fulfillment in the virgin birth of Jesus Christ hundreds of years later.